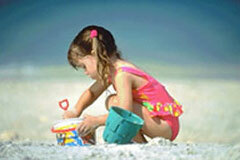 About St. Pete Beach & Pass-a-Grille, Florida - BeachDirectory.Com - The entire Florida Gulf Coast...in detail! 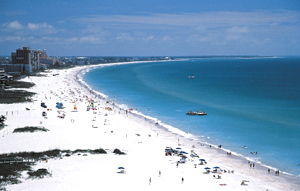 St. Pete Beach is a barrier island community stretched out along 4.5 miles of sandy beaches. Its permanent resident population of just over 10,000 nearly doubles during the winter months, making it one of the more popular tourism areas on the Suncoast. On the southern tip of St. Pete Beach lies Pass-a-Grille, a charming historical district with a flavor that is reminiscent of an Old Florida artists' colony. This idyllic, unspoiled community started as a fishing village and was inhabited long before the rest of the island. Today, its galleries, restaurants, bed-and-breakfasts and shorelines draw tourists from all over the world. In St. Pete Beach alone there are over 3,000 vacation accommodation units available to visitors, including major hotel and resort condominiums. There are also motels and smaller, more intimate lodging facilities. 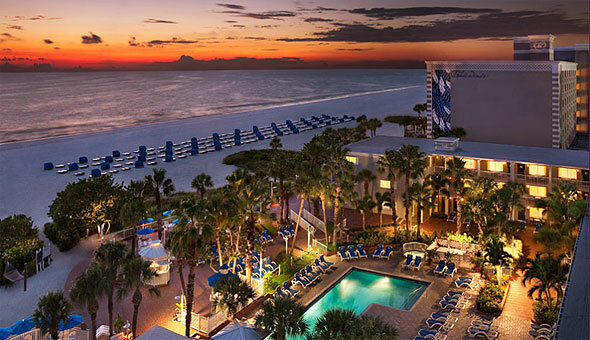 Below is a picture of Island Grand, part of the Tradewinds Island Resorts (the largest resort on the Gulf Coast of Florida). For those of you not staying on the beach, there are many pedestrian beach accesses, as well as one beach access with 235 parking spaces (parking fee) located at 4700 Gulf Blvd. As you might expect from a major tourist beach, you'll have no trouble finding something to do on the water. Just walk down the beach and you'll find waverunner rentals, scuba diving, fishing and parasailing. To enjoy the privacy of a secluded beach take the 10-minute ride to lovely Shell Key (pictured on the left) on the 49-passenger Shell Key Shuttle catamaran. It's worth your effort getting to this secluded beach just to see the shells (they don't call it Shell Key for nothing!). Bring a picnic basket and enjoy the unspoiled beach or the quiet lagoon behind the island. If you have access to a private boat, Egmont Key offers 440 acres of secluded beaches and historical attractions such as a 150-year-old lighthouse and gun batteries built in 1898 to defend Tampa during the Civil War. Also a wildlife refuge, don't be surprised to see various species of birds, Gopher Tortoise and Box Turtles in this state park. A more accessible historic and secluded beach area can be found at Fort Desoto, a 900-acre Pinellas County Park located in the Southwest corner of Mullet Key. Visitors can tour the post buildings, relax on the beach, fish or simply enjoy the natural, unspoiled beauty on a nature walk. Pictured on the right is the historic Don Cesar Hotel located at the South end of St. Pete Beach. A National Historic Landmark, the Pink Castle is known for its rich history and notable clientele such as F. Scott Fitzgerald, Franklin D. Roosevelt and Al Capone. Tours of the Don's beautiful botanical gardens are available at very reasonable rates. If you're looking for a hotel slightly less stately, St. Pete Beach has the highest number of hotel/motel rooms of any community along the Suncoast - more even than Clearwater Beach!! Check out our site for a list of motels and hotels in the area. If you are looking for someplace to call home during your stay in St. Pete Beach, Resort Rentals has listings all along the Gulf Beaches. The Partida Home, on Boca Ciega Bay in St. Pete Beach, is a great two bedroom, two bathroom home with a pool, just blocks away from the beach. For additional places to stay, visit the Pinellas County Superior Small Lodging website to see a list of small properties that have passed a rigorous annual inspection. Tired of the beach? Take a stroll down historic Corey Avenue where you will find a number of charming shops such as an old-fashioned 5 and dime store, Kris Kringle's Christmas Shoppe, and the local favorite "Beach Theatre", which shows independent films and other movies not from Hollywood. For daytime or nighttime fun, visit the popular St. Petersburg Pier (downtown St. Petersburg, approx. 12 miles away), which boasts more than a dozen shops, many restaurants, and a small aquarium all inside of this 5-story inverted pyramid overlooking the Gulf. Stroll along downtown St. Petersburg, with its galleries, live music venues, and restaurants. Baywalk also offers a lot in the way of entertainment, dining and shopping. For more information about St. Pete Beach, visit the City of St. Pete Beach website for city news, library hours, information on basketball, softball, volleyball and other leisure activities, activities for children 5-12 and activities for seniors. It is a useful site for residents and visitors alike.